The Grand Lux Cafe Chicken N Waffles is my favorite brunch item at the Grand Lux Cafe. If you have been to the Cheesecake Factory, you are going to love the Grand Lux Cafe, it is one of their sister restaurants. You might think that Chicken N Waffles is a strange combination. 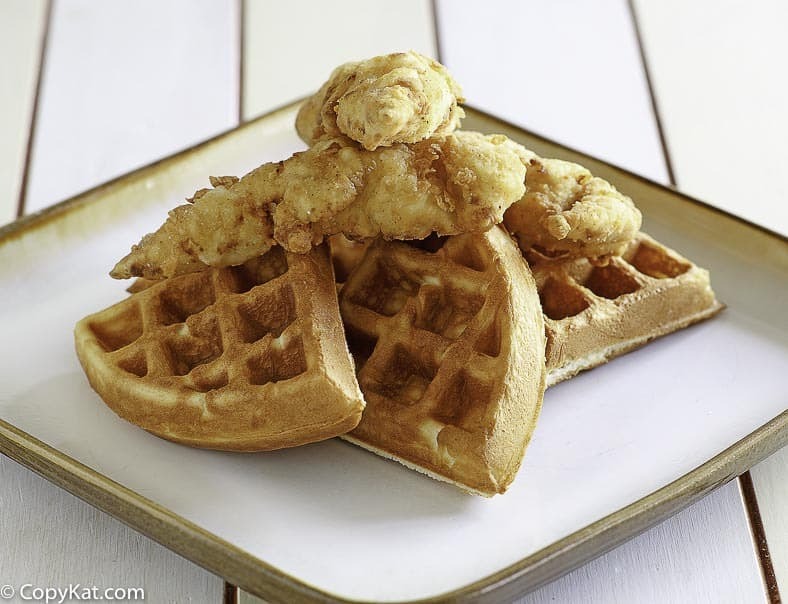 If you have not tried this combination of fried chicken and waffles, you are missing out on a sweet, crunchy, and salty combination that you need to try. Many restaurants offer this type of brunch recipe. What makes the Grand Lux Cafe is that they use chicken tenders, the chicken tenders mean you don’t need to pick up that chicken and take a bite of it. This mesmerizing concoction can be enjoyed with a fork and a knife. These waffles aren’t your normal waffles, these are Belgium waffles, so they are light, fluffy, and wonderfully tender on the inside. You will need a Belgium waffle iron to make this recipe. If you don’t want to use this, please use a regular waffle recipe. The restaurant uses the fancier waffles. The chicken tenders are one of my favorite parts of this recipe. These chicken tenders are battered with a seasoning and a buttermilk mixture that means the crust is crunchy and perfectly crispy. This with the waffles makes for one amazing combination. The Grand Lux Cafe sweetens the warmed butter they serve with this recipe. I find that the sweetened butter is enough for me, that I don’t need syrup. They do serve this with warmed real maple syrup. I know that you are going to love these with or without syrup. You can make these wonderful waffles any day of the week. In a large bowl, stir the flour with the salt. In a medium bowl combine the yeast mixture with the 3 egg yolks, 1 egg white, and the remaining 1/3 cup of sugar; stir to blend. Add the remaining water, milk, melted butter, oil, vanilla, and almond extract. Stir until the batter is smooth and creamy. Stir the liquid mixture into the flour mixture and beat until smooth. Beat the remaining 3 egg whites in a clean, dry bowl. (If the bowl isn't perfectly clean, the whites may not fluff up as much as they can.) Beat until stiff peaks form. Fold the egg whites gently into the batter. Let the batter stand for 1 hour, stirring every 15 minutes. Chicken Tenders In a deep pot or a deep fryer preheat the vegetable oil to 350 degrees F. In a medium bowl, stir together the flour, pepper, seasoned salt, and salt. 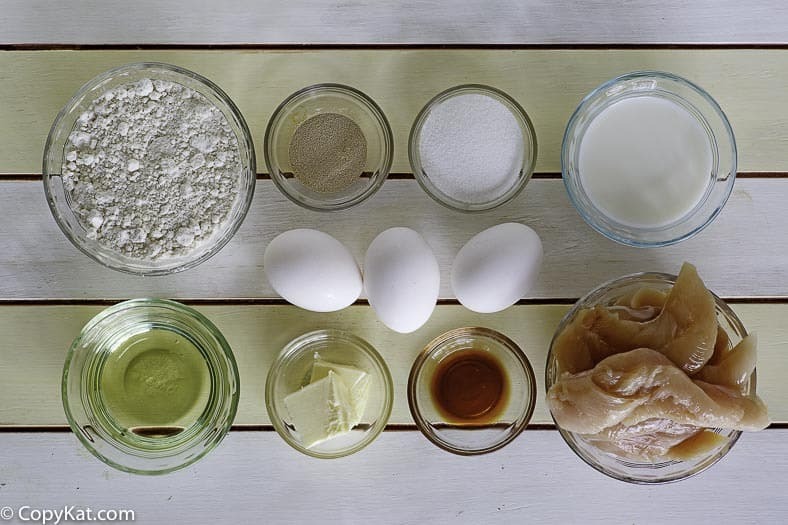 Pour buttermilk into a shallow 8 x 8-inch baking dish. Pat the chicken tenders dry with a paper towel. Dredge each tender in the seasoned flour, shake off the excess, and dip in the buttermilk. Dip back into the seasoned flour, shake off the excess flour, and set aside on a wire rack. Let the chicken tenders rest for about 5 minutes before cooking so the crust will form a nice crunchy outer layer. Fryer only a few chicken tenders at a time. Fry for 5 to 6 minutes, or until golden brown. Depending upon the depth of the oil you may need to turn over the chicken tenders at about 3 minutes of the cooking time. Place on a clean wire rack so they may cool when you remove them from the hot vegetable oil. Preheat a Belgium waffle maker to medium heat. Scoop the batter onto the waffle maker, you may want to use a heatproof spatula to spread the batter over the waffle iron. Close and cook until the waffle is done. Your waffle iron should have an indicator to let you know when the cooking has been completed. Sweetened butter instructions In a small saucepan over low heat, gently melt the butter. Stir in the powdered sugar. Serve warm. 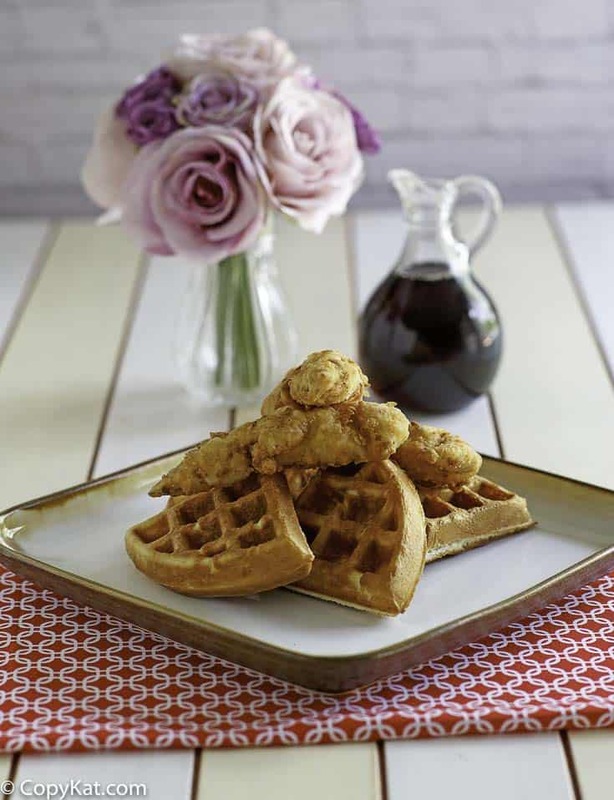 Place a waffle on a plate, top with 4 chicken tenders, dust with powdered sugar, and serve with the sweetened butter. Can I just say, everyone loved this when I made it for bruncb? Wow, the cake looks delicious, I like this cake. Somethings off in the recipe. No water mentioned in the ingredient list for the waffles , but is referred to in directions. Also bpnot clear on the amount of sugar. Ingredient list and directions are different. I’m making them as soon as I can. Thanks! I really liked the sweetened butter in this recipe. Goodness! That waffle batter sounds divine! So do the chicken tenders…very nice to be able to use a knife and fork. Thanks, Stephanie, for a great recipe.